For the Turkish sports club Fenerbahçe, sometimes referred to as "Fener", see Fenerbahçe S.K. 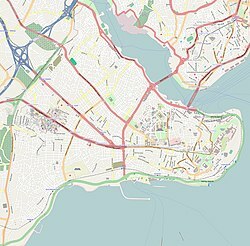 Fener (Turkish pronunciation: [feˈnæɾ]) is a quarter midway up the Golden Horn within the district of Fatih in Istanbul, Turkey. The streets in the area are full of historic wooden mansions, churches, and synagogues dating from the Byzantine and Ottoman eras. The wooden mansions between the main axis and the shore were often used for importing wood from Pontus or the Black Sea area. Their picturesque facades were largely destroyed due to street widening requirements in the 1930s and later.The area's name is a Turkish transliteration of the original Greek φανάριον (a lighting lantern, a streetlight, a lightpost with a light lantern) It was so called for a column topped with a lantern which stood there in the Byzantine period – used as a public light or marine and/or other purpose locator/beacon. After the Fall of Constantinople in 1453, the Fener district became home to many of the Greeks in the city. The Patriarchate of Constantinople moved to the area as well and is still located there. As a result, "Phanar(i)" (the traditional spelling) is often used as shorthand for the Ecumenical Patriarchate, just as "Vatican" is used for the Holy See of the Roman Catholic Church. During the Ottoman period, the Greek inhabitants of Fener were called "Phanariotes" and were important assistants to the Sultan in various capacities and offices. Wealthy Phanariotes were appointed as governors over provinces in Turkish Europe and Greece, and as hospodars of Wallachia and Moldavia between 1711 and 1821. The Phanar contains the patriarchal cathedral of St. George. Its main entrance is never opened since the hanging in 1821 of the patriarch there at the time of Greek independence. The oldest surviving Greek school in Istanbul, Ozel Fener Rum Lisesi, is found in Fener. The school was established in 1454. An important Bulgarian church, St. Stephen ("The Iron Church"), lies between the patriarchate and the shore of the Golden Horn. There are a number of other barely used Greek Orthodox churches. ^ "Τριανταφυλλίδης On line Dictionary". Φανάρι(-ον) (3α). Retrieved October 7, 2006. Wikimedia Commons has media related to Phanar.